Stuttering and Cluttering provides a clear, accessible and wide-ranging overview of both the theoretical and clinical aspects of two disorders of fluency: stuttering and cluttering. This edition remains loyal to the idea that stuttering and cluttering can best be understood by first considering various overarching frameworks which can then be expanded upon, and provides a clear position from which to disentangle the often complex interrelationships of these frameworks. The book is divided into two parts, the first of which mainly deals with theory and aetiology, while the second focuses on clinical aspects of assessment, diagnosis and treatment. The book also provides frequent references across Parts I and II to help link the various areas of investigation together. 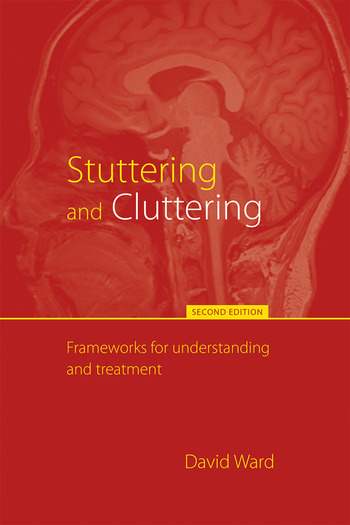 This revised edition of Stuttering and Cluttering reflects the major changes in thinking regarding both theory and therapy that have taken place since the publication of the first edition. As well as those who stutter and clutter, the book will be invaluable for speech language therapy/speech language pathology students, practicing clinicians, psychologists and linguists around the world. Part 1: The Aetiology of Stuttering and Cluttering. Introduction - What is Stuttering? Normal Disfluency and Stuttering. Primary and Secondary Stuttering. Definitions of Stuttering. Prevalence and Incidence. Who is at Risk of Stuttering. The Development of Stuttering. Phenomena Associated with Stuttering. The Causes of Stuttering. Spontaneous Recovery. Making Sense of the Data: Stuttering as Balance between Capacity and Demand. Summary. Key Points. Suggestions for Further Reading. Part 2: The Treatment of Stuttering and Cluttering. The Measurement and Assessment of Stuttering. Treating Early Stuttering. Therapy for School Age Children. The Treatment of Stuttering in Adults. Counseling Approaches. Alternative Approaches to the Treatment of Stuttering. The Efficacy of Stuttering Therapy. Acquired Stuttering. The Assessment, Diagnosis and Treatment of Cluttering. David Ward is Director of the Speech Research Laboratory at the University of Reading, UK, and a specialist fluency clinician for Oxford Health within the NHS. He has published extensively on both aetiological and clinical aspects of disorders of fluency. The first edition of his textbook Stuttering and Cluttering was published in 2006. He is also co-editor of Cluttering: A Handbook of Research, Intervention and Education (2011) and co-author of Managing Cluttering (2013).